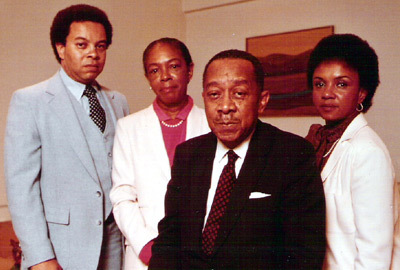 This is a photo of Columbia CORE member Hilton Clark (left, blue suit) with his sister and their parents, Dr. Kenneth (center) and Mamie Clark. Born and raised in Harlem, Hilton when interviewed remembered there being only 6 Blacks in his class of 400 at the time he joined Columbia CORE in the early 1960’s. He was arrested demonstrating in CORE’s campaign against the Schaffer Brewery in 1964. He also claimed membership in ACTION and participated in the John Jay cafeteria at Columbia. Hilton was also one of the founders of the Students Afro-American Society, one of the main student groups responsible for the student takeover of Columbia University in 1968. He stated in his interview that he quit Columbia by the end of 1964 to work in Mississippi with Bill Strickland of the Northern Student Movement and Fannie Lou Hamer on voter registration. Because he quit college, Hilton stated he was drafted into the Army where he worked in Intelligence. Dr. Kenneth and Mamie Clark are two of the most significant psychologists in the history of the United States. Their work on the doll test led to the success of the Brown vs. Board of Education Supreme Court decision. Dr. Kenneth Clark served on New York CORE’s Board of Advisers and also on the board for CORE’s Scholarship and Education Fund. He was also the first Black person to earn a PhD in psychology from Columbia University. “photo of Hilton Clark, Columbia Univ. 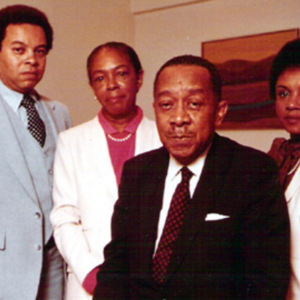 CORE, with his father, Dr. Kenneth Clark, and family,” corenyc.org, accessed April 18, 2019, http://www.corenyc.org/omeka/items/show/255.